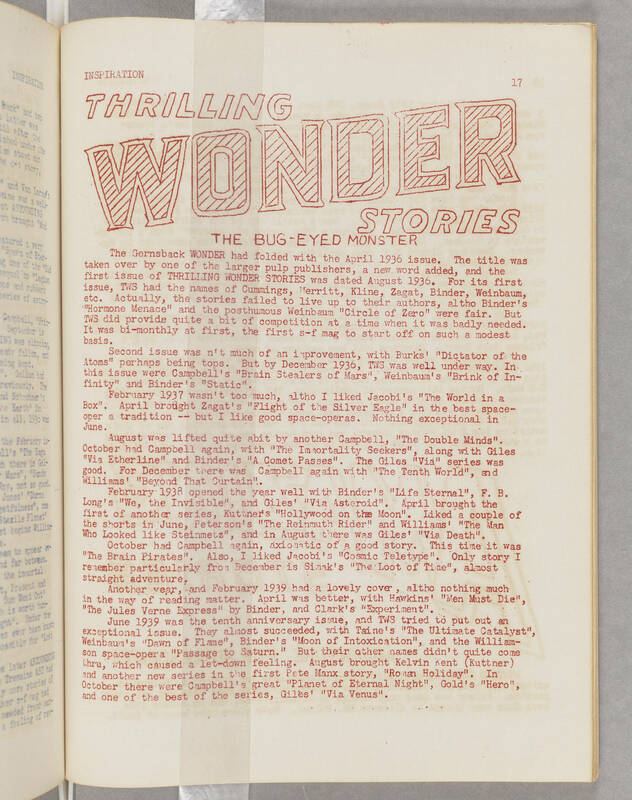 INSPIRATION 17 [title is printed in large bubble letters] THRILLING WONDER STORIES [centered] THE BUG-EYED MONSTER The Gernsback WONDER had folded with the April 1936 issue. The title was taken over by one of the larger pulp publishers, a new word added, and the first issue of THRILLING WONDER STORIES was dated August 1936. For its first issue TWS had the names of Cummings, Merritt, Kline, Zagat, Binder, Weinbaum, etc. Actually, the stories failed to live up to their authors, altho Binder's "Hormone Menace" and the posthumous Weinbaum "Circle of Zero" were fair. But TWS did provide quite a bit of competition at a time when it was badly needed. It was bi-monthly at first, the first s-f mag to start off on such a modest basis. Second issue wasn't much of an improvement, with Burks' "Dictator of the Atoms" perhaps being tops. But by December 1936, TWS was well under way. In this issue were Campbell's "Brain Stealers of Mars", Weinbaum's "Brink of Infinity" and Binder's "Static". February 1937 wasn't too much, altho I liked Jacobi's "The World in a Box". April brought Zagat's "Flight of the Silver Eagle" in the best space-opera tradition -- but I like good space-operas. Nothing exceptional in June. August was lifted quite abit by another Campbell, "The Double Minds". October had Campbell again, with "The Immortality Seekers", along with Giles "Via Etherline" and Binder's "A Comet Passes". The Giles "Via" series was good. For December there was Campbell again with "The Tenth World", and Williams' "Beyond That Curtain". February 1938 opened the year well with Binder's "Life Eternal", F. B. Long's "We, the Invisible", and Giles' "Via Asteroid". April brought the first of another series, Kuttner's "Hollywood on the Moon". Liked a couple of the shorts in June, Peterson's "The Reinmuth Rider" and Williams' "The Man Who Looked like Steinmetz", and in August there was Giles' "Via Death". October had Campbell again, axiomatic of a good story. This time it was "The Brain Pirates". Also, I liked Jacobi's "Cosmic Teletype". Only story I remember particularly from December is Simak's "The Loot of Time", almost straight adventure. Another year, and February 1939 had a lovely cover, altho nothing much in the way of reading matter. April was better, with Hawkins' "Men Must Die", "The Jules Verne Express" by Binder, and Clark's "Experiment". June 1939 was the tenth anniversary issue, and TWS tried to put out an exceptional issue. They almost succeeded, with Taine's "The Ultimate Catalyst", Weinbaum's "Dawn of Flame", Binder's "Moon of Intoxication", and Williamson space-opera "Passage to Saturn." But their other names didn't quite come thru, which caused a let-down feeling. August brought Kelvin Kent (Kuttner) and another new series in the first Pete Manx sotry, "Roman Holiday". In October there were Campbell's great "Planet of Eternal Night", Gold's "Hero", and one of the best of the series, Giles' "Via Venus".